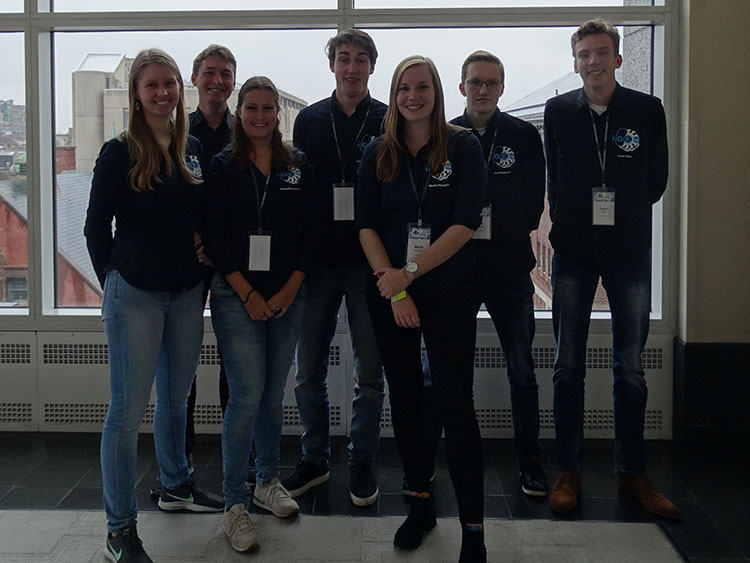 The TU Eindhoven team of 2017 has won a golden medal and was nominated for Best New Application! Cancer is a major cause of death worldwide. With our project, GUPPI, we hope to set the basics of a system that can encapsulate the cancerous tissue to prevent metastasis in an early stage. GUPPI utilizes Protein Protein Interactions and is inspired by the formation of membraneless organelles by multivalent interactions. A designed protein scaffold and its binding partner, both having sequential repeating units, will respond to an inducer and form a gel-like structure. We envision that later on, GUPPI can respond to extracellular conditions that will act as an inducer of the gelation to specifically target and encapsulate the desired tissue. The GUPPI system has some major advantages, such as the tunability of the protein’s multivalency and the possible adaptation of interactions. Furthermore, a rule-base-model is developed to predict, verify and characterize the wet-lab experiments and act as an additional support. Below, an animation is shown which shows the formation of the gel-like structure. The scaffold protein is depicted in light-blue and its binding partner is depicted in orange.